Edward Tickle loved his wife, Bess. It turns out that Bess Tickle loved her husband, but she also loved pink flowers. The California State senator who served the state in the 1930s and 1940s and his wife built a home south of Carmel; a stone cottage with the moniker of Tickle Pink. In the 1950s the senator’s home was razed and commercial lodging was built on the site. “My grandfather owned paper on the Highlands Inn next door (now a Hyatt property) and originally built the Tickle Pink Inn as an addition to the neighboring Highlands Inn,” says Tickle Pink Inn owner Al Gurries. 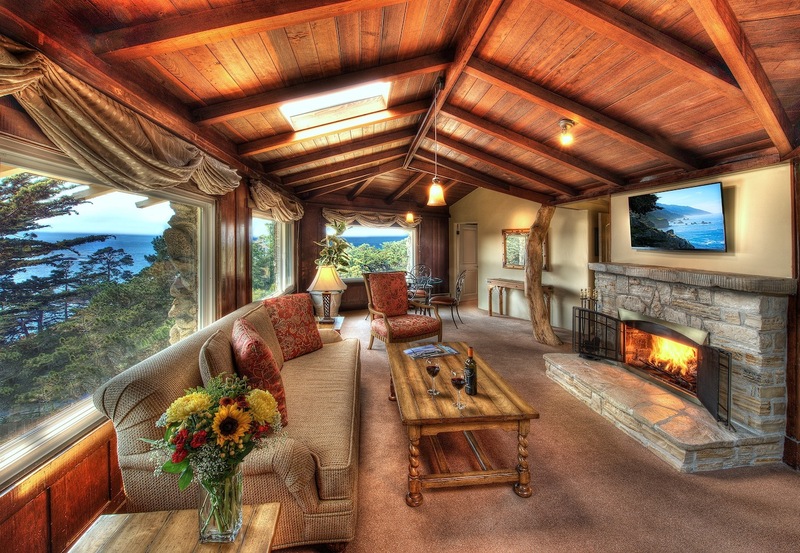 But that deal fell through and the place was reinvented as the Tickle Pink Inn, the only family-owned lodging south of Carmel and north of Big Sur. The Inn has always been a source for rejuvenation and retreat from a busy world, and after new upgrades to this AAA Four Diamond property, it’s better than ever. First off, let’s dispense with the obvious pink and tickle references; it’s all been done before. Wisely, the Inn begged off its former kitschy pink theme and, yes, at one point it was a nauseating saturation of pink everywhere, from sheets to towels to even the pens. “When in doubt, pink,” says Gurries who assumed control from his pink-loving uncle in 1989. “The name does conjure up perhaps a risqué place, but it really works and it’s a name you don’t forget,” he says. The selling points of being here are summed up in two words: view and retreat. 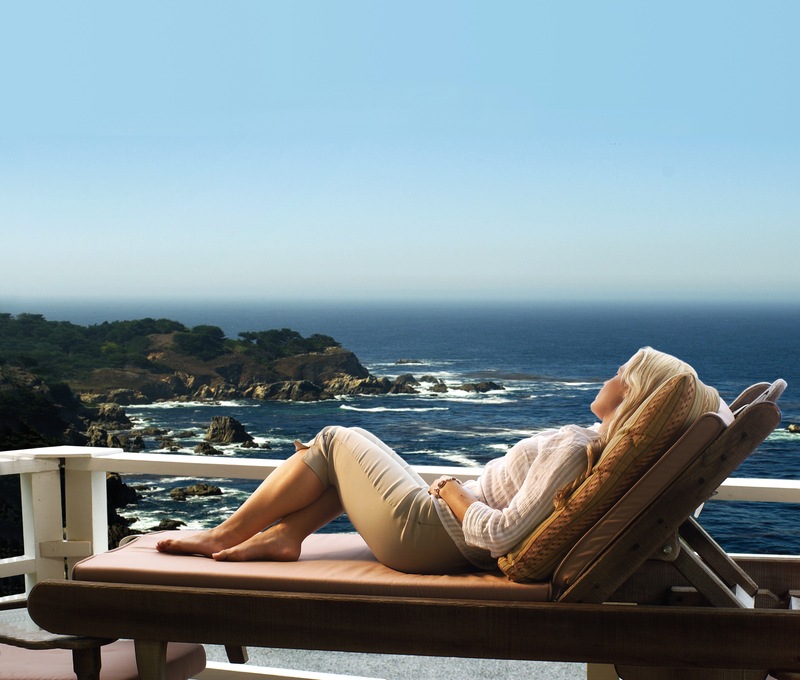 You can not talk about the inn without mentioning what is arguably its best feature; the views are insane: uninterrupted ocean, rugged cliffs with trees clinging to the steep hillsides in defiance of gravity and aggregate rocks dotting the surf. Each of the 35 rooms has views, some with balconies 25 feet long and glass windows and slider doors to match. Yet the inn, basically three levels cut into the side of the hill, still has a retro feel, what with the painted cinder block walkways and strategically placed round windows. It’s prudent to mention that there are no elevators; therefore some stair climbing might be necessary unless you stay on the top level, accessed by the parking lot. Every guest receives a bottle of sparkling wine, a small box of chocolates, two Champagne glasses and a rose to tie it all together upon arriving. There are wood-burning fireplaces and deep whirlpool tubs in the higher end rooms, in-room coffee that succeeds in that there is a canister of coffee you can measure out, not a pre-packaged plastic pouch of predetermined coffee that may or may not suit your needs. In-room massage is available, from Monterey-based massage practitioners, as well as free Wi-Fi, Iphone docking stations and loofah sponges. The evening wine and cheese reception in the Terrace Lounge, overlooking the Kashmir blue of the Pacific, features three main cheeses: Port Salut, goat cheese and cambozola, along with the ubiquitous cubed cheddar, pepper Jack and Swiss. The wines are predominately local, Chateau Julien being a favorite here. Red, white and rosé wines accompany non-alcoholic sparkling cider, as well as coffee and tea. Couples meander in, select their beverages and snacks, then huddle together on the glassed-in deck, urgently awaiting the sunset over Yankee Point. There are intimate conversations as the amber hues of the setting sun paint their wine glasses with the fading rays of sunshine. “We try and achieve the perfect property for a romantic rendezvous,” says Gurries. The lounge with its rustic wood chairs and tables pulls in the suggestion of the surrounding trees, and with heaters mounted along the deck you can linger awhile on cool evenings. From there dinner can be had by driving to Carmel about four miles upcoast, since the Inn does not have a restaurant. However, they do offer full room service from the neighboring Highlands Inn, some 100 feet away. 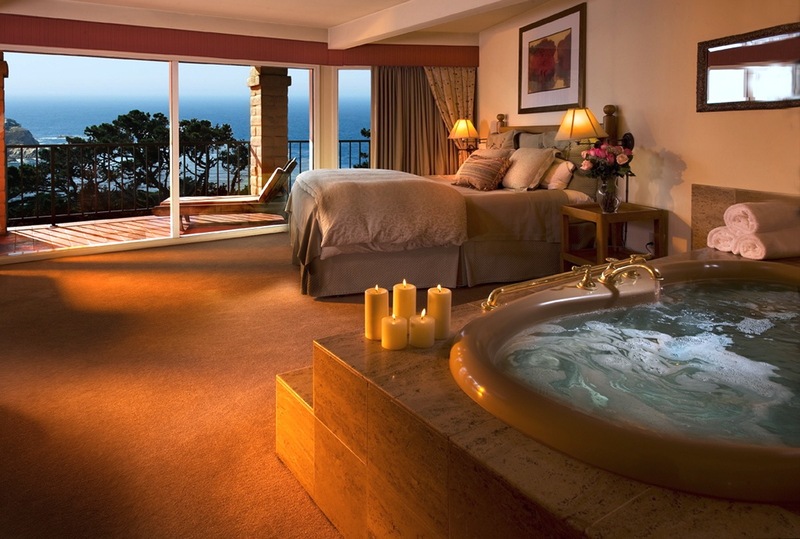 After dinner you may choose to utilize your spa tub, should your room have one. If not, there is the outdoor hot tub. Basking in the water with the stars splayed out above, you look straight onto two cypress trees, the ocean as a backdrop, the distant sounds of the crashing surf a delicate punctuation to quiet conversation. In the morning breakfast is at your disposal. It can be delivered to your room, or you can head back to the lounge and choose from yogurt and granola, egg dishes, ham, blueberry scones, assorted juices and coffee and tea and enjoy the repast from the decks. The benefit to being up early is that you can sit and watch the morning sun slowly creep over the white caps, illuminating the rocks and hillsides as the landscape comes alive. Though you can take a stroll along Highway 1, it’s really not advisable as the traffic on the narrow and winding road can be lightening fast. Instead, you can get a brisk walk and additional views if you head further up Highlands Drive. It’s not a steep incline but will raise your heart level and get you past some charming and architecturally diverse homes, past trees with Spanish moss hanging from them like mini curtains to the sea. But the beauty of the Tickle Pink Inn is that should you choose a romantic weekend, you never have to leave your room, what with the views and everything brought to you. It can be your retreat away from the hectic pace of life. Yes, it’s a small boutique hotel, and if you’re into bold and modern this is not for you. And this is the success of the Tickle Pink. It’s not geared for high-strung workaholics who need a disturbingly cluttered schedule. It is made for those who have anchored down, the ideal spot to isolate yourself, rejuvenate and gain perspective. It is not about being seen, but being unseen, unavailable and unconcerned. And after staying here you will feel refreshed, emboldened and yes you’ll be tickled…well, you know. Michael Cervin is the restaurant critic and contributing travel writer for the Santa Barbara News-Press, and author of four Moon travel guide books. He is the contributing editor for The Tasting Panel Magazine, the senior editor at Bottled Water Web, and regularly contributes to a variety of publications including The Hollywood Reporter, Decanter (London), Fine Wine & Liquor (the largest wine magazine in China), Wine Enthusiast, 65 Degrees (his Stay column is devoted to high-end properties) Wine & Spirits, Sommelier Journal, Westways, Palate Press, Skywest, Food & Beverage World, and many others.He also writes two travel blogs and a wine & spirits blog.